As we join people all over the world today on May Day to celebrate workers’ struggles, mourn the victims of capitalism, and continue the call for social and economic change, we’d also like to take a moment to humbly commemorate the 20th anniversary of the LA Rebellion. 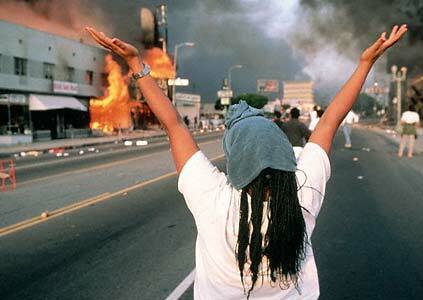 Sparked by the not-guilty verdict for LAPD officers in the brutal beating of Rodney King, Los Angeles exploded. From April 29th to May 4th, residents primarily from the city’s Black and Latino communities took to the streets. 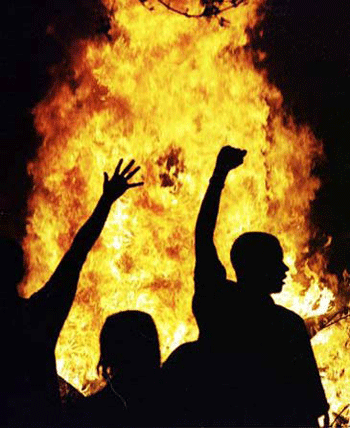 They raged not only against the rampant, unchecked, daily brutality of policing, but also the related and intensely racialized violence of economic exploitation and poverty, grinding unemployment, the systematic gutting of educational and social services and programs, skyrocketing rates of imprisonment, ecological devastation, gentrification, and debilitating disenfranchisement and dispossession. For six days—with all the excitement, creativity, complexity, problems, tragedies, and messiness that comes with spontaneous uprising—there was no business as usual in LA, or many other places as well. Those in power, however shaken, responded in their typical fashion, combining overtly racist nationalist speeches, news reports, and editorials, with out and out military occupation of the city. More than 10,000 National Guard troops coordinated with countless other law enforcement and military agencies to put down the rebellion. Nearly 7000 residents were arrested and at least 10 were killed by the state’s backlash. While we might be more familiar with images of destruction of mostly commercial property, less told are the stories of sporadic armed conflict between residents and police and troops. While the uprising ended after several days–the troops didn’t withdraw until several weeks later–communities’ struggles certainly did not. People began to try to understand the roots of the rebellion and the ramifications of its impacts. While corporate media and the academy played its role in the state’s divide and conquer strategies, by branding the uprising a race riot, expounding continuously on the disintegration of the moral fabric of the Black community, and stoking a mythology of hopeless interracial antagonism and conflict, others sought to understand the political moment and what work there was to do moving forward. One hidden story in the wake of the rebellion were the broad-scale and highly organized truces between formerly rival Black and Latino gangs. Indeed, these truces emerged from analysis and strategizing by residents and organizations of various political bents that were not content to merely ‘heal’ from the uprising but instead sought to extend its potential and energy toward radical and transformative ends. Truce, of course, was a dangerous proposition for those for whom healing meant the swift re-imposition of the status quo. Funds slated to aid community rebuilding efforts never materialized or just disappeared, poverty and joblessness continued. The LAPD persistently tried to undermine and sabotage the truce, and eventually to co-opt its success. A prominent rallying cry of the rebellion was: “no justice, no peace!” While a narrow understanding of the slogan could be that it referred only to the not-guilty verdict for the officers who beat King, we can also extend it to residents’ understanding of the inequitable and oppressive social and economic conditions under which they lived, as well as a warning and threat against the status quo. 20 years later many of the same conditions exist in Los Angeles that did in ’92: very little justice, and very little peace. Poverty is still widespread, as are the lack of social services and programs, decent housing, and educational opportunities. The violence of policing and imprisonment is also a present as ever. Indeed entire theories, strategies, and technologies of policing modeled on post-rebellion LAPD have been packaged and sold to cities all over the world. Wholly a third of all prisoners throughout the state are taken from Los Angeles County and LA’s county jail system is one of the largest on the planet. As we commemorate the hard-fought struggles of workers across the world today, we must not forget the far-reaching impacts of capitalism on our understandings of race, gender and place, nor the lengths to which the state will go to repress challenges to that institution. Today we also commemorate those lost and hurt in the LA rebellion as well as those that continue to resist the violence of policing and imprisonment.